Is your bike prepared for deep water? Back when I started trail riding, with points ignition, six-volt electrics and primitive carburetors, just keeping and engine going in light rain, let alone under solid water, was considered a matter of some luck. Modern dirt bikes are however remarkably reliable, and can run in water well over the crankcases. Higher voltages, solid state electronics and better components, all make for far more reliable riding in bad conditions and the increasing use of fuel injection may improve matters yet. 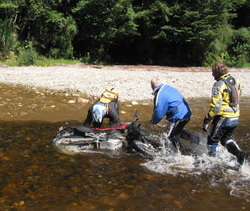 However manufacturers still have to make compromises, engines need to breath and the very need for this creates a chink in the armour, especially now in the case of environmental concerns, so there still are some areas of preparation to consider if your riding includes a lot of riding in water. You may have the skills, but is your bike prepared for deep water? Extra vent hoses can be led back, high under the rear of the seat. To work, carburetors need to be vented to the atmosphere, and to safely drain surplus fuel when the bike is tipped on the side. 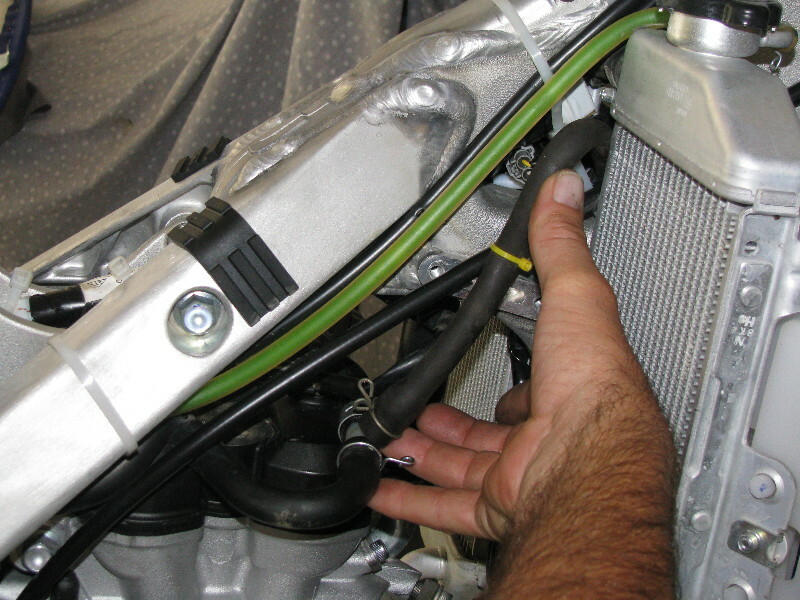 Modern carburetors have several vent and overflow hoses, often working in combination. These essential tubes exit below the engine, just in front of the swing arm. 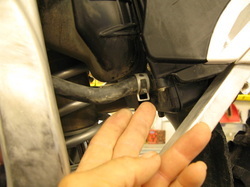 In some cases, if all hoses are suddenly submerged, a vacuum lock can interrupt the fuel flow and the bike will begin to bog, or even cut out, even though there may be no water in the carb. An answer is to fit T pieces to the two vent tubes which cross over the top of the carburetor and lead the extra tubes back under the seat. In this way the carb can always breath. See the details pics below for more details. Most MX bikes employ an unreliable direct to the atmosphere crankcase vent. Four strokes in particular require loads of crankcase ventilation. This is usually provided via a 10-15 mm hose from the cam cover and until recent times, and in most MX bikes run down to exit low in the frame. A baffle system is built into the cam cover to reduce the chance of water finding it’s way back into the engine sump. However this very undesirable scenario can happen when vacuum is created in a cooling engine, for instance one submerged for a time in water or mud while the vent is also submerged. If water contamination is present the oil will appear a milky white. Water in the oil is a serious matter and will harm bearings. The engine must be drained and flushed as soon as possible. It may be tempting to block this hose, but if you do, or the hose blocked your engine will loose power, or blow a cam box gasket. One answer to this problem is to fit a T piece near to the breather near the cam box and lead a secondary breather up and under the steering stem section of the frame, usually the driest part of the bike. Fitting a T piece and secondary breather will ensure the crankcase breathes even in ugly conditions. Increasingly on many road legal enduro models the breather is now led into the bottom of your airbox, so any nasty fumes can be re-consumed. That’s all very nice, unless you accidentally fill your airbox with water, in which case some of that water can flow back into your engine, contaminating the oil. The solution is to remove the vent from the airbox and lead it down to a suitable point low in the frame where it won’t get crimped. 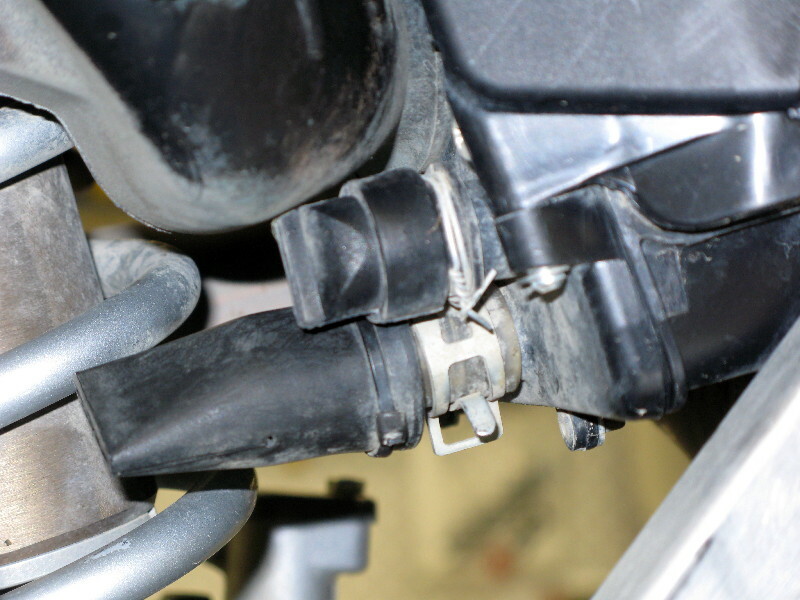 The resultant hole in the airbox will have to be securely plugged with a suitable blank. A secondary breather as above will still be required. Two strokes have simple breathing requirements. A smaller tube from behind the cylinder vents only the gearbox. This tube should be led high under one side of the fuel tank and looped down about 100 mm on the far side. Check ATV parts books and wreckers for hose, clips and T pieces. Two stroke gearbox vents are not nearly as problematic and water contamination (milky looking oil) with water though serious, will seldom stop the ride. Check for water after every wet ride as with a four stroke. If water is present check your gearbox breather routing. Extend the breather to rise up high in the frame on one side of the bike and descend about 150mm on the opposite side. Later model enduro four strokes often lead the crankcase vent direct to the bottom of the airbox. Detail of an MX drain valve from an older YZ 250. Again, for environmental concerns, some enduro and trail bike airbox drains are now completely plugged. The problem is that water once in the airbox can’t get out, greatly increasing the chance of taking water past your filter. Remove the blank plug and fit a one-way drain valve from an MX model. The blank plug might be just what you are looking to plug a crankcase vent hole with. Alternately, like I do, you might like two airbox drain valves. This airbox also takes in air at lower levels. Where air goes water will too. Most , but not all enduro bikes take in air at seat-base level, however some, including most MX bikes, have various air entries at lower levels to improve tep end power. How waterproof your airbox really is may affect your decision making when faced with deep water. Covering lower air vents is an option, but may decrease performance slightly, or require jetting adjustment. Dirt bike electrics are now so good that shorting problems are rare. The advent of o-ring sealed terminal connectors in critical areas mean that water simply doesn’t get in. A potential problem area is when riders have damaged kill buttons and their wiring, either with tie downs or from bush riding. Zip tie your kill button wires to the underside of the bar to help prevent damage. Replace damaged kill buttons with good waterproof OEM quality items. After you have been under water, or even just riding in water check your four-stroke engine oil and two-stroke gearbox oil for water contamination. Quality oils will absorb some water and retain lubrication, but if the oil has the slightest milky look, change your oil (and oil filter if fitted) immediately. 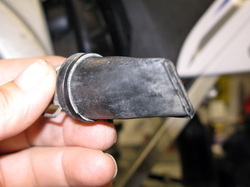 Also clean the airfilter, dry your airbox and check carb float bowl for water. Watch Trail Tech for more on what to do, if you drown your engine.